I just had cataract surgery yesterday on my left eye, for a cataract that’s been there since 2005 when I had glaucoma surgery. It’s been something I’ve been mulling over for a few years. Every medical specialist who looks at my eyes always pointed out the lovely star shaped cataract sitting there, and were amazed that I could actually see through it. 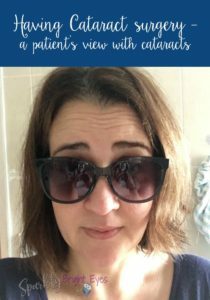 So seeing there are probably a lot of others out there waiting to have the same procedure, I thought I’d write a quick post about having cataract surgery – a patient’s view with cataracts. What it’s like to experience it. Cataracts are a clouding of the natural lens of the eye. It’s more common than other eye conditions and the leading cause of blindness worldwide. There are numerous conditions that can cause the formation of cataracts including high myopia, eye surgery, prolonged corticosteroid use, previous eye injury or inflammation. I’ve had all of those, but my optometrist is of the opinion it was caused by the glaucoma surgery. 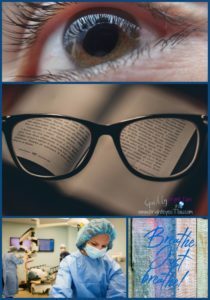 When you are first deciding to have (or told you need to have) cataract surgery you will be given a lot of literature about the procedure, and possibly even shown a video describing the procedure used by your doctor. It can be a lot of information to take in, and seem a little scary too with some of the risks. Your eye specialist will take quite a few measurements of your eye/s to check suitability for the procedure they have in mind. And then more measurements for the artificial lens to be ordered. You may be given a choice of a few types of lenses that will replace your natural lens, or you may only be suited to one type. (Upon reflection given my previous surgery and ongoing glaucoma, my doctor decided that lenses fixed for distance vision were best for me). The morning of surgery. Last moments wearing contacts or prescription glasses. On your surgery day you will be required to fast prior to your booked time, due to sedation being used in the procedure. It’s only a light sedation with some local injected around the eye…they don’t want you moving during this delicate procedure. You may be required to finalise some paperwork on arrival. You then have a nurse see you for preparing you for surgery. I was given a gown over my comfy day clothes and a cap to cover my hair. Then some local anaesthetic drops were placed in my eye. Next a tiny sponge with dilation solution was inserted in my lower lid (apparently my eyes are a bit slow to dilate as they had to put extra in a little later). After a little wait, I was then put on a surgery bed and was visited by the anaesthetist. A canula was put in one hand, and some sedation administered. After that you get quite a bit groggy. Awake, but not really feeling anything much and wheeled into the surgery. They tape your other eye closed and you have a surgical drape over your head. But with so much anaesthetic around your eye and the sedation, your eyes really can’t see anything while the surgery takes place. For which I think we’re all thankful. We don’t really want to see all that they’re doing while we’re still awake. It wasn’t a terribly long operation. Around 30 minutes. Most of the time is spent in the pre and post operation activity. After the surgery had finished, I was wheeled back out and a nurse put some ointment in my eye (which I could not really feel to know if I really was closing it for her) and an eye patch on. A bit of time waiting there and then I was helped up and out to another room to have some sandwiches (the staple of hospital food). And given my list of post-surgery instructions. Be sure to ask any questions you may have in regards to medications to take after, or other instructions. I take a set of eye drops already for my glaucoma at night, so checked I still took those as usual after my post-operation set of 3 eye drops. You will need to be driven home by someone else after surgery, as you can’t drive for 24 hours afterwards. If your other eye needs glasses or a contact lens, you can still manage those. I had my right contact lens in (as my myopia is so severe I wouldn’t be able to do anything). But in the evening when I took that out for overnight cleaning, I was able to place my glasses on over the eye patch…enough to see. All the sedation takes a while to wear off, but afterwards you may need some painkillers. You did just have delicate surgery to your eye after all! I had Panadol in the evening and again in the morning after. So far I haven’t needed anything more. 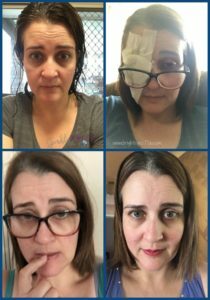 I did find the eye patch most uncomfortable for the night, and didn’t really sleep well with it (though a toddler sharing my bed could have been keeping me more awake too). Next time I may ask for some sleeping tablets to help with that first night. (I’m due to get my right eye done in two weeks time). It’s quite bright after surgery and those drops do sting for the first few days. 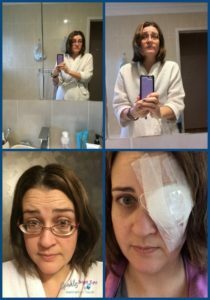 The next day you may be booked in to go back to the specialist to have the eye patch removed, or be told to remove yourself if your next appointment is more than a day away. I had to remove mine at home, which I did gingerly as it felt like half my hair had got caught on the ends of it. I kept my eye closed for that as was a bit afraid of the result and what the vision would be like. When I had glaucoma surgery my vision had been blurry for a day or more after. I then dashed off to a darker room to try opening my eye. And was pleasantly surprised at the clarity in the vision from my new lens. But opening that eye in a room with a light on hurt my eye and made it water, so I had to resort to wearing sunglasses inside for half the day. Not something you often get to do. And it is true that you cannot adjust your sight in that eye with a new lens to be able to read. At first during the day, any writing I looked at I couldn’t make out head or tail about, except that I knew it was writing. Later on as I adjusted to it, I could make out some huge writing on things. But that was it. I’m hoping I won’t have to wait too long after my second operation to get reading glasses, as my jobs heavily rely upon it. Plus the fact I love reading for enjoyment too! Two eyes done now and needing reading glasses to see small print and things on my mobile phone. The drops I find a pain in the time it takes to do them, 5 minutes apart between each, but only one I find painful when put in the eye. All the rest are easy to do. Luckily after 14 years or so experience with glaucoma drops, and longer wearing contact lenses, I’m quite adept at doing multiple eye drops. If you are not, you may need to enlist someone’s help for the month you have use them. Next week I go back for the measurement for the other eye, and my second surgery will be 2 weeks after the first. (It’s not actually removing a cataract, but is replacing the lens as my vision was too great a difference to have nothing done with that eye). At least it shouldn’t be as scary as the first one was…worrying the night before and the wait during the day till my surgery time. I know now having experienced the first one. 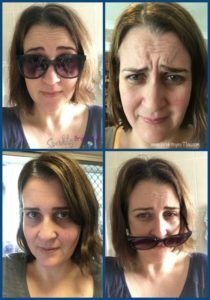 Hopefully this post has helped explain the procedure from a patient viewpoint and made it a little less scary for you too. Now that I’ve had both eyes done, the vision is great for distance. I’m still adjusting to the need for reading glasses for small print, and finding the right size for using computers, but a very good result still! Comment below if you have been considering surgery or had it yourself. What is MS? And what exactly does it feel like?